If you recall the sequence of events discussed in the first half of the scenario, all of the datastores were re-added from replicated LUNs on another SAN. Although the datastores have the same names, and all of the files were retained, the VMFS volumes were re-signatured. This means that from the perspective of vCenter, these are totally new datastores with new UUIDs. Let’s have a quick look at the moref identifier associated with the shared-hdd0 datastore where dlr-a1 used to reside. Is it still datastore-26? Using the URL string trick, we can see that shared-hdd0 has a moref of datastore-682. Not anymore. It’s now datastore-682. This means that every time we try to re-deploy, NSX is attempting to do so based on the old location in its database. Since datastore-26 doesn’t exist, it can’t even start the process. Thankfully, fixing this is quite straight-forward. Even though the appliance doesn’t exist, we can still update its configuration. We simply need to change datastore-26 to a valid datastore location that can be accessed by the deployment cluster selected. Editing the appliance allows us to change its configuration even if it’s not deployed. This can be updated via API call, but in recent versions of NSX, we can simply change this from the UI. Notice the drop-down for datastore is blank because of the invalid selection that was there previously. Deployment occurs immediately after changing the datastore to a valid one. Immediately after modifying the appliance and selecting shared-hdd0 as the datastore, the appliance started deploying on its own. A manual re-deploy task is not necessary. The above process works for both ESGs and DLRs, but you’ll need to remember to change both appliances if enabled for HA mode. Once both HA appliances have been changed to a valid datastore, they’ll start deploying. The datastore on which the NSX Edge was installed is corrupted/unmounted or in-accessible. …you must update the MoId of the resource pool, datastore, or dvPortGroup using a REST API call." ??? The public documentation references an API call to update the moref, but it does seem that you can make this change in UI – at least in recent versions of NSX. Thanks to everyone who left comments and suggestions! 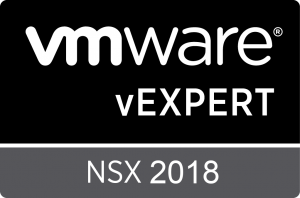 You’ll find that vSphere, NSX and the majority of VMware’s products rely on unique identifiers as opposed to names to identify inventory objects. Knowing how to find and compare these can make all the difference in troubleshooting. For more information on how to find common moref identifiers used by NSX, see this post. © vswitchzero.com, 2017-2018. Unauthorized use and/or duplication of any material on this site (including text, photos/images and video) without express and written permission from this site’s author and/or owner is strictly prohibited. Excerpts and links may be used, provided that full and clear credit is given to the author and with appropriate and specific direction to the original content.